Arguably the greatest amateur athlete who ever lived. A graduate of St. Paul’s School in Concord, NH; Hobey Baker became one of the greatest amateur athletes in a turn-of-the-century America that was embracing superstars for the first time. A football and hockey Hall of Famer from Princeton, his athleticism and sportsmanship inspired F. Scott Fitzgerald to base a character on Baker in This Side of Paradise. A hero pilot in World War I, Baker died tragically in a mysterious plane crash just as hostilities were ending. His life story inspired college hockey to name its annual award for the nation’s top player, The Hobey Baker Memorial Award. His real life exploits seemed custom made for a television biography. But somehow, after all of these years, Hobey Baker’s compelling story never found its way to mainstream media until now. Baker was born in Bala Cynwyd, Pennsylvania, a suburb of Philadelphia. He attended St. Paul's School, in Concord, New Hampshire, graduating in 1909. In 1910 he enrolled in Princeton University. During his time there, he was elected to the Ivy Club, while also playing baseball, football and hockey. Because Princeton's athletic rules limited athletes to participation in only two varsity sports, Baker gave up baseball after his freshman year, concentrating solely on football and hockey. 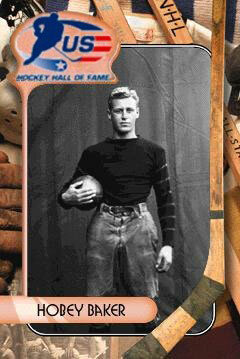 By the time he graduated, he had led Princeton to a national championship in football (1911) and two national championships in hockey (1912 and 1914). He enlisted in the U.S. Army as a pilot upon the country's entry into World War I and left for Europe in 1917. By 1918, he was a member of the Lafayette Escadrille, commanding the 103rd Aero Squadron and painting his Spad XIII orange and black in honor of his alma mater. Hobey Baker was tragically killed in plane crash just weeks after the armistice ending the war while test flying one of his squadron's newly repaired Spads near Toul.Baker is not only considered one of the greatest ice hockey players of his era, but is also regarded as the first great American hockey player. In 1945 he was inducted into the Hockey Hall of Fame, one of only a handful of Americans to be so honored, and was inducted into the United States Hockey Hall of Fame as one of its charter members in 1973. In 1975, he was also inducted into the College Football Hall of Fame. The Hobey Baker Story is a stirring account of Baker’s life, told with film clips, photographs, and interviews with Hobey's nephew, distinguished sports figures, and historians. On-camera interviews include Olympic ice hockey Gold Medalist Bill Cleary, WWI aviation expert and author Charles Woolley, and UNH professor and sports historian Stephen Hardy. They all describe Hobey Baker as an all-American hero who met a tragic and untimely death. Major funding for this project was made possible by the members of New Hampshire Public Television. Additional funding was provided by a special gift from a member of the Profile Society.